A spectacular launch of the Dawn spacecraft into a beautiful Florida sky in this NASA image of the Sept. 27, 2007 space shot. A NASAprobe blasted into space early Thursday, kicking off an unprecedented mission toexplore the two largest asteroids in the solar system. Riding atopa Delta 2 rocket, NASA?sDawn spacecraft launched toward the asteroids Vesta and Ceres at 7:34 a.m.EDT (1134 GMT) from Cape Canaveral Air Force Station in Cape Canaveral, Fla.
?In myview, we?re going to be visiting some of the last unexplored worlds in thesolar system,? said Marc Rayman, Dawn director of system engineering at NASA?sJet Propulsion Laboratory (JPL) in Pasadena, Calif. Dawn?seight-year mission will carry the 2,685-pound (1,212-kilogram) probe acrossthree billion miles (4.9 billion kilometers) on NASA?s first sortie deep intothe asteroid belt, a ring of space rocks that circles the Sun between theorbits of Mars and Jupiter. By visitingthe bright, rocky asteroid Vesta and the large, icy Ceres, researchers hopeDawn will shed new light on the formation of planets and solar system?s earlyevolution. Aside froma wayward ship, which delayed today?s launch by 14 minutes when it encroachedinto the Atlantis Ocean splashdown zone for segments of Dawn?s rocket, theliftoff went as planned, NASA launch director Omar Baez said. Dawn isexpected to rendezvous and orbit the 330-mile (530-kilometer) wide Vestabetween August 2011 and May 2012, then move on to Texas-sized Ceres by February2015. With its spherical shape and 585-mile (942-kilometer) diameter, Ceres isso large it is also considered a dwarf planet. ?It will bethe first mission to journey to, and orbit around, two celestial bodies, andthe first to visit a dwarf planet,? said Dawn program manager Jim Adams, atNASA?s Washington, D.C. headquarters, of the asteroid-bound flight. Dawncarries an optical camera, gamma ray and neutron detector and a mappingspectrometer tostudy Vesta and Ceres. Some of those tools will get a trial run during aplanned Mars flyby in 2009, researchers said. To powerthose instruments, the spacecraft is also equipped with the most powerful solararrays ever launched into deep space. With awingspan of nearly 65 feet (almost 20 meters), or about the distance from thepitcher?s mound to home plate on a baseball field, the arrays will generatemore than 10 kilowatts near Earth, though that output will decrease as thespacecraft moves further from the Sun. NASAofficials set Dawn?s mission cost at $357.5 million excluding the cost of itsDelta 2 rocket, according to a September update. In a July briefing, Dawnresearchers said the asteroid-bound flight could cost a total of $449 millionand incur an extra $25 million in overhead due to launch delays. Attempts tolaunch the mission in July were thwarted first by poor weather and rocketglitches, then by difficulties arranging ship and aircraft tracking equipmentin time for liftoff. 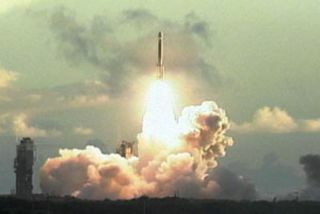 NASA also canceled the mission outright in March 2006,only to reinstate the expedition a few weeks later. ?It hasbeen quite an emotional rollercoaster,? Chris Russell, Dawn's principalinvestigator at the University of California, Los Angeles, said of the mission. ?And part of the emotional rollercoaster is the gratitude that we have for allof the people that defended Dawn in those times.? Built by Virginia-basedOrbital Sciences, the Dawn spacecraft has been touted as the Prius of spaceprobes because of the uncanny fuel efficiency of its three-engine ion drive. Dawncarries 937 pounds (425 kilograms) of Xenon gas, to which it gives an electriccharge to create ions that are then catapulted out of its engines at nearly90,000 miles per hour (144,840 kph). Over time, the ion push builds up, andallows Dawn to change its flight path to first rendezvous, then orbit, multipletargets like Vesta and Ceres without requiring massive amounts of conventionalrocket fuel. ?The firsttime I ever heard of ion propulsion was in a ?Star Trek? episode,? said Rayman,adding that such engines are also touted to propel the TIE fighters ? or TwinIon Engine - of ?StarWars? fame. ?Dawn does the TIE fighter one better because it has three ionengines.? While itwill take Dawn four days to go from zero to 60 miles per hour (96 kph), theprobe will gradually pick up speed as it fires its ion drive nonstop for thenext six years, NASA has said, adding that the mission is the agency?s firstoperational science expedition powered by ion propulsion. ?That wouldmake it the longest powered flight in space history,? said Keyur Patel, NASA?sDawn project manager at JPL, just before liftoff. Each of thethree ion engines weighs about 20 pounds (nine kilograms) and is about the sizeof a basketball. "Fromsuch a little engine you can get this blue beam of rocket exhaust that shootsout at 89,000 miles per hour,? Patel said before launch day. ?It is aremarkable system." NASAwill hold a post-launch briefing on Dawn?s asteroid-bound mission at 1:00 p.m.EDT (1700 GMT) on NASA TV.